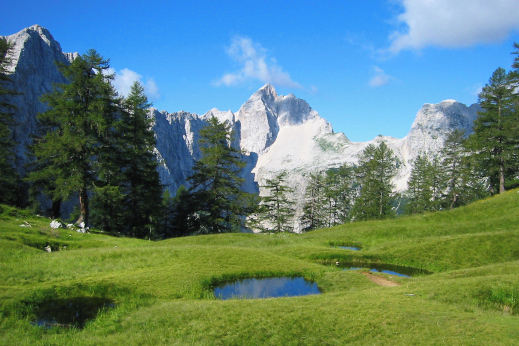 Hiking Slovenia – through the heart of the majestic Julian Alps, Slovenia’s prime outdoor playground. Traversing Triglav National Park from the alpine lakes of Bled and Bohinj to the valley of the emerald-green Soca river. 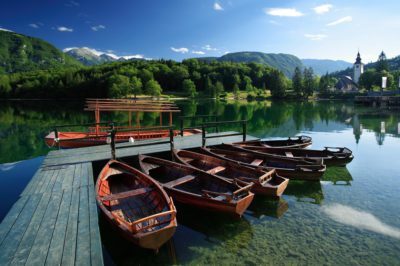 Exploring Bled, one of Europe’s most scenic spots. The bell tower of the 12th century pilgrimage church rises proudly from a tiny storybook islet in the middle of the lake, guarded by the medieval castle perched high atop a cliff. Alpine meadows and grazing cattle, century-old farms, homemade shepherd’s cheese and old wooden cottages that look like something straight out of a fairy tale. The Triglav Lakes Valley, with its glacial lakes and ponds, is known as one of the most beautiful parts of the Julian Alps. 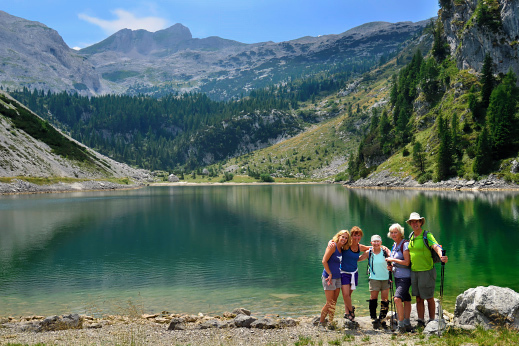 Summit 6600ft / 2000m+ peaks with incredible views and experience the unspoiled alpine scenery. The panoramic Vogel plateau above Bohinj Lake offers magnificent vistas towards the Julian Alps and the Pokljuka plateau. Enjoyable walking adventures in pristine nature on scenic, safe and well-maintained hiking trails on flat to rolling and occasionally challenging terrain. The emerald-green Soca River, once the scene of legendary WWI Isonzo front battles that inspired Hemmingway’s A Farewell to Arms. 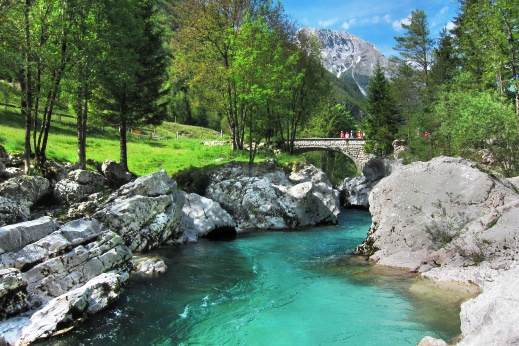 Today the river’s pristine waters and beautiful surroundings make it one of Slovenia’s greatest natural treasures. Exploring the charming village of Kranjska Gora, a ski resort only a 10-minute drive from the Italian and Austrian border that hosts many World Cup Alpine Ski races and offers a unique blend of Slovenian, Austrian and Italian culture and gastronomy. Lodging in charmingly rustic mountain huts with hot showers and comfortable nights in double or triple rooms, depending on availability. Experiencing the highland cheese-making culture, marveling at wildflowers and catching a glimpse of the magnificent and rare Alpine ibex. Ending the tour with a stroll through Ljubljana, the capital of Slovenia. Reminiscent of Prague and tracing its roots to the ancient Roman city of Emona, Ljubljana is a city full of beauty and inspiration, an oasis of lush green parks, open-air libraries and cobblestone streets winding through the medieval old town beneath an 11th-century castle. From 1220 EUR; contact us for self-guided option! Daily trip to Postojna or Skocjan caves and Piran on the Adriatic coast. Wooden shepherds’ cottages that look like something straight out of the Grimm’s Hansel and Gretel fairy tale. We meet in Bled, one of Europe’s most scenic spots. Bled’s picture-perfect setting sets the tone for your visit in Slovenia. The bell tower of a 12th-century pilgrimage church rises proudly from a tiny storybook islet in the middle of the lake, guarded by the medieval castle perched high atop the cliffs. You can choose to spend the night before the start of the tour here or in the vibrant capital city of Ljubljana (in which case we will organize a morning shuttle to take you to Bled, where the tour will begin). 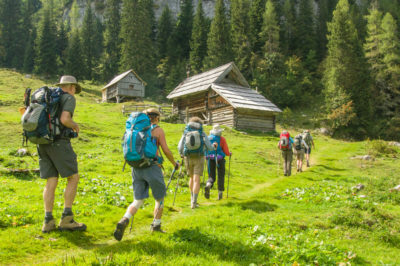 In the morning we meet for a brief orientation and then set off for the Pokljuka plateau, located at the foothills of the Julian Alps, to start our tour with a short warm-up hike. The hike starts at Rudno polje, where the Biathlon World Cup takes place every year. We continue on forest trails, passing green meadows with grazing cattle where you can pause to take a photo of the wooden shepherds’ cottages that look like something straight out of a fairy tale and try some traditional apple strudel. Walking along the mountain ridges by Mt. Triglav we enjoy some of the most dramatic views in these parts of the Alps. The night is spent just beneath these towering giants. Accommodation in mountain hut Vodnikov dom. The crystal clear waters of the largest of the seven lakes. Today we hike further into the heart of the Julian Alps. Passing the Hribarice mountain pass (7781ft/2358m), we enter into one of the most beautiful high-altitude alpine valleys at the foothills of Mt. Triglav, Slovenia’s highest peak. Colorful alpine flowers carpet the valley floor – Zois bellflower, Carniolan Lily, Erica, Gentian, with some luck we can even spot the elusive Edelweiss. Stop for lunch at a mountain hut along the trail and see if we can spot the untamed chamois sunbathing on the bare Karst rocks. 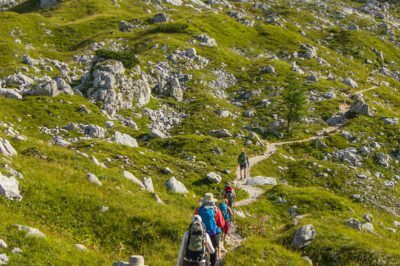 Beautiful hike traversing the Triglav Lakes Valley on mountain trails with 6600ft/2000m peaks on your left, the vast green mountain plateau of Komna on your right and the trail snaking past the seven small lakes that give the valley its name. Tonight you spend a night in the Triglav Lakes Valley right by one of the lakes. End the day with a warm cup of herbal tea and a hearty mountain barley soup with sausage. Accommodation in mountain hut Koca pri Triglavskih jezerih. Blooming meadows with Mt. Ticarica in the distance. We wake up surrounded by the serenity of the mountains. We enjoy a short walk along a small lake surrounded by larch forest and start ascending, eventually reaching the tree line and continuing our hike on limestone rock. Reaching the peak of Mt. 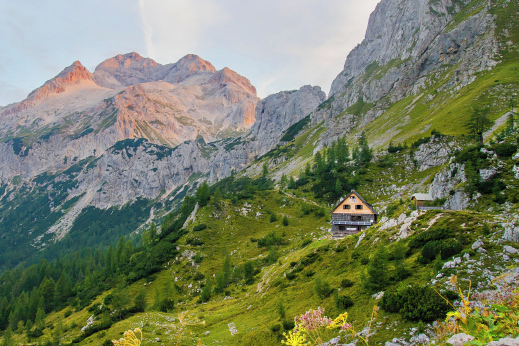 Ticarica (6834ft/2071m), a majestic view opens up as the Triglav Lakes Valley unfurls beneath us and Mt. Krn looms in the distance. 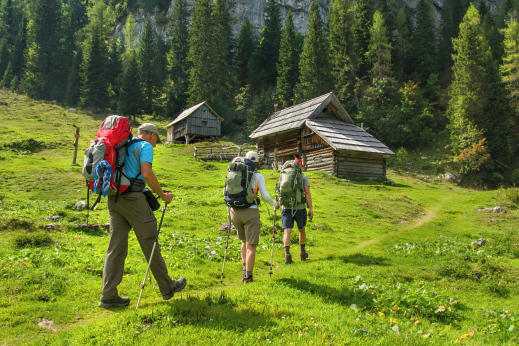 Hiking through alpine meadows is the best way to get a feel for the traditional herding lifestyle that still exists in this region, with shepherds spending whole summers looking after their animals in the mountains and making great local dairy products. Explore the shepherds’ traditional way of life and stop for lunch to taste the local delicacies, such as ricotta cheese, hearty mountain soup with vegetables, homemade tea and honey brandy. With some luck the shepherds might also expand the bellows of their accordions and play some traditional alpine tunes. 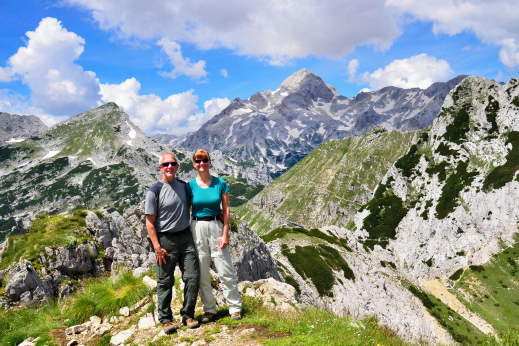 Happy hikers with amazing views in the heart of Julian Alps. 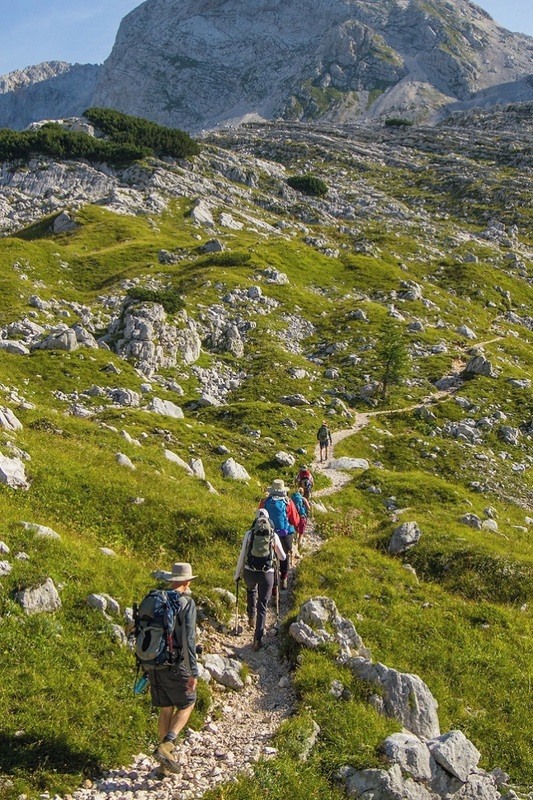 Today we hike along the ridge of the Komna plateau, with craggy limestone rocks to the right and spectacular views towards the glacial Bohinj Lake to the left. After the morning hike we reach Komna plateau on the dramatic western side of the lake. 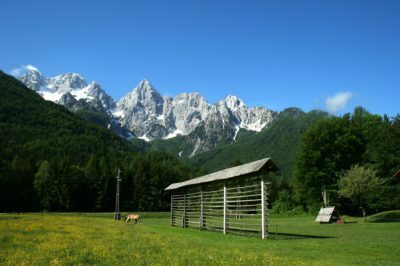 This is the mythical home of Zlatorog (“Goldenhorn”), an ibex buck with golden horns who holds the keys to a golden treasure and lives in these mountains according to local legend. This area is known to the locals as the “Kingdom of the Goldenhorn”. Enjoy a leisurely afternoon in the tranquility of nature or opt for some more hiking on the nearby alpine meadows of Planina Govnjac. Perhaps try a goulash stew with polenta tonight. Accommodation in mountain hut Dom na Komni. 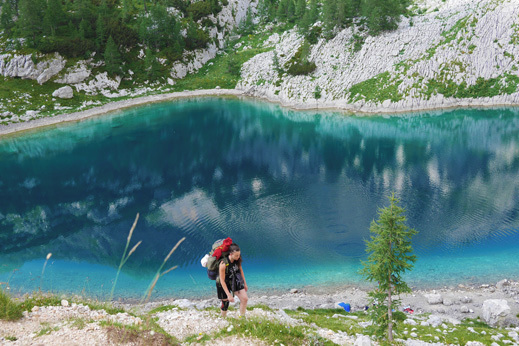 Today’s hike will take you to Krn lake and picturesque views in the heart of Julian Alps. Today we traverse to the southwestern Julian Alps, where the Mediterranean influence can be noticed in local heritage, cuisine and culture. We will be hiking on trails where Italian and Austro-Hungarian troops fought at the Isonzo Front during World War I, setting the scene for Ernest Hemingway’s novel A Farewell to Arms. Following an old trading route past shacks that served as makeshift hospitals during the war brings the region’s recent history to life. This remote area is home to beautiful mountain flowers and highland pastures. The cattle grazing in this pristine highland environment produces uniquely delicious goat and sheep cheese – make sure to stop by a shepherd’s cottage and try it! You can opt for an additional round-trip hike to Mt. Lanzevica or descend to Lake Krn and rest your weary feet on the sunny shores of the lake. Accommodation in mountain hut Planinski dom pri Krnskih jezerih. This morning we descend towards Lepena Valley, where the confluence of two rivers created the stunning gorge of Sunikov vodni gaj. In this nature’s playground small waterfalls fill ponds and small lakes along a rustic forest trail. Time to try some well-deserved local specialties of the Soca Valley, such as compe (pronounced “chompeah”), freshwater trout and dumplings filled with fresh cheese or minced meat. After lunch we hike upstream the Soca River. The waters of this emerald beauty are an adventure paradise for white-water rafting and kayaking aficionados, yet its serene setting and deep turquoise color seduces every romantic soul. We hike part of the way towards Vrsic pass (5316ft / 1611m) and cover the rest of the distance by driving along one of the most beautiful mountain roads in Europe, its hairpin turns offering astonishing views of exquisite alpine scenery. This winding mountain road, following the twists and turns of an earlier trading route, was built for military purposes by Russian prisoners of war during the First World War. The border between Italy and Yugoslavia used to run through Vrsic Pass and nowadays the road sets the bar of endurance for eager road cyclists. We spend the night surrounded by the looming peaks of Mojstrovka and Prisojnik and enjoy the traditional highland dinner of jota, a stew made of sauerkraut, brown beans, potatoes and sausage. Accommodation in one of the mountain huts at Vrsic pass. Small alpine lakes at Sleme peak. 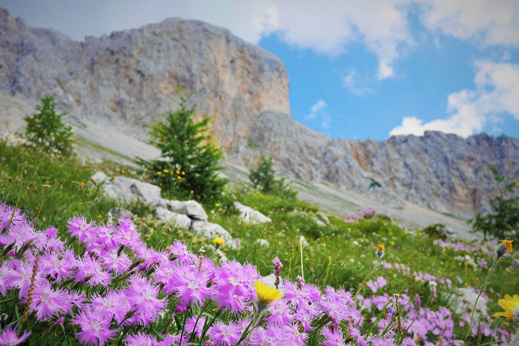 From Vrsic Pass we start the hike to Sleme and enjoy a picnic lunch with sweeping views of the Julian Alps. The afternoon descent is followed by a shuttle to Kranjska Gora, a ski resort that hosts the annual FIS Ski World Cup, only a step away from the Italian and Austrian border. Tonight we try various culinary delicacies that blend the traditions and tastes of the three neighboring countries into a unique gastronomy: sea bass with pomegranate sauce and aged vinegar, beet soup with orange and a drop of cognac, or deer ravioli braised in dark beer on a bed of red cabbage and topped with wild honey, to name only a few of the mouth-watering options. DAY 8 Transfer to Ljubljana. End of tour. End your trip in a bustling and charming Ljubljana, Green capital of Europe 2016. Breakfast at your leisure followed by a morning transfer to the vibrant city of Ljubljana or directly to Ljubljana airport (onward flights should depart no earlier than 2:00 p.m.). Ljubljana, the 2016 European Green Capital, is a city full of beauty and inspiration, an oasis of lush green parks, open-air libraries, winding cobblestone streets of the medieval old town and countless bridges crossing the lazy waters of the Ljubljanica River. Explore the ancient stories of the city in the Ljubljana Castle and immerse yourself in this unique hideout before continuing your travels in the hustle and bustle of other European capitals. accommodation in the huts are dormitory style (2/4/6 beds in a bedroom, shared bathrooms), some huts offer showers, all huts offer dinner – please contact us for more information. We had a wonderful time and enjoyed the very personalized service we received every step of the way. We thoroughly enjoyed our experience with Trek Trek. As independent travellers and experienced hikers, we prefer self guided hiking. Trek Trek spent a lot of time talking with us about what kind of trek we wanted to do in terms of days on the trek, as well as average distances and gain/loss each day. Based on our input they put together a proposed itinerary which we then reviewed and revised to our liking. We received tracks for the trek in advance and also had an in person pre trek briefing which was extremely thorough and included very well marked maps of our route. We had a wonderful time and enjoyed the very personalized service we received every step of the way. We highly recommend this company whether you want to hike alone or have a guided experience. We would not hesitate to use Trek Trek again." Please also feel free to use us as a reference. Keep doing what you are doing it is excellent. Your communication and responses are very good, the itinerary excellent and our guide was wonderful. We really enjoyed the opportunity to hike a little more slowly and enjoy the flowers and take pictures. We very much enjoyed the hiking, the nature, the history and the scenery. We learned a lot about Slovenia, and saw many beautiful places. We enjoyed hearing about the history of the area, and also the opportunity to do some sightseeing. The last hotel where we stayed did a very nice wine tasting. We were lucky to have found your company on the internet and booked through you. I want to thank you for such a wonderful trip through Slovenia. Slovenia truly is one of the secret gems of the world. I have been recommending your country and company to all my friends. Thank you for the fantastic hike you put together for me last month. Both of the guides were fantastic. The hikes were challenginging, the scenery beautiful and the people super. Thank you again!